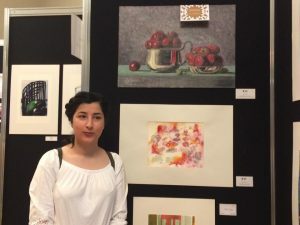 Students Excel at Craft-Ex 2018! Glasgow Kelvin students have yet again made their mark at this year’s Glasgow Trades House Craft-Ex competition. 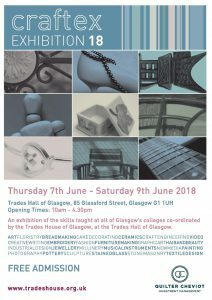 The annual competition, organised and hosted by Glasgow Trades House, celebrates the best of creativity in the local college sector by exhibiting student work for three days in early June. This year, Glasgow Kelvin students carried off ten awards, including the coveted Deacon Convener’s Design Prize. This went to a delighted Valentina Boneva, a jewellery student, for her exquisitely crafted jewellery box, influenced by the art nouveau of the Glasgow Style. 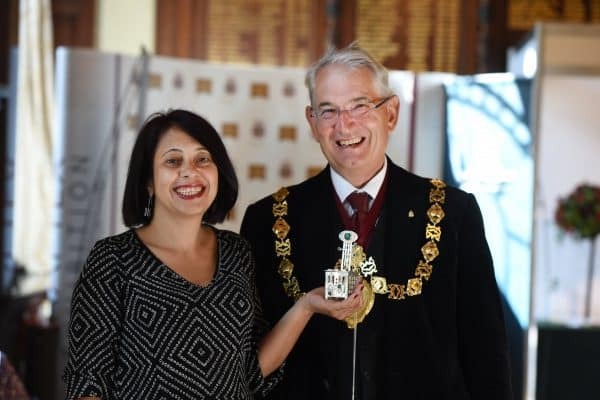 Valentina is pictured above with Mr Alastair Dorward, Deacon Convener of the Trades House of Glasgow. The Award is sponsored by Thomas Tunnock’s Ltd and Valentina wins a cheque and certificate. Another of the awards went to the Fashion Design and Manufacture Team for their fabulous Radiant & Brighter wall hanging. 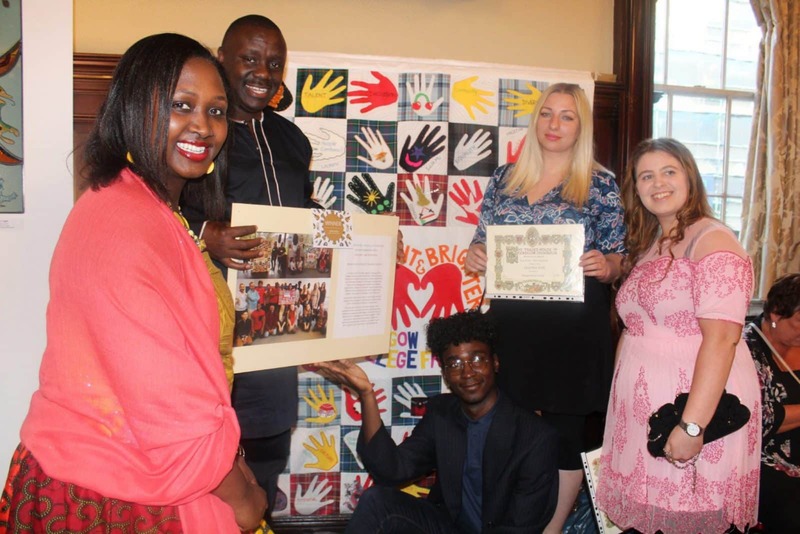 The vibrant textile piece was created by the students in partnership with participants in the Radiant & Brighter project, an initiative supporting minority ethnic groups with the aim of tackling social barriers and cultural challenges in the community. Pictured with Pheona and Michael Matovu of Radiant & Brighter are students Ineta Joksaite, Kayley Molloy and Jerome Kasusula. Other Glasgow Kelvin winners on the day included Somayeh Iraji, Emmabel-Nour, Becky Hanlon, Dianne Chapman, Alison Copeland and Frank McAllister. 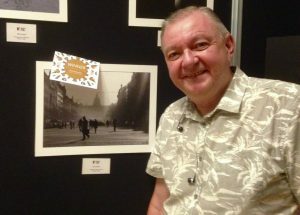 The College is grateful to Trades House for organising the prestigious exhibition and proud to be the home of such amazing talent - congratulations go to everyone involved in these achievements! 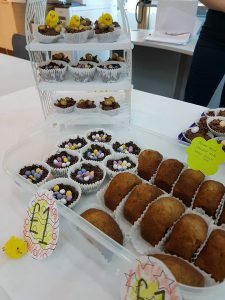 Cake, Displays and Time Off! 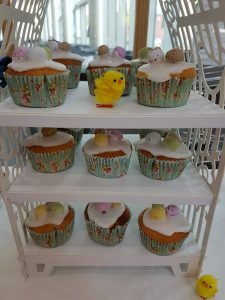 We hope you are all enjoying the first day of your Easter break, here's hoping the snow doesn't make a reappearance. 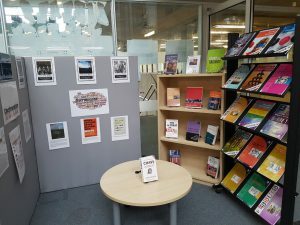 The college has had a couple of fundraising activities this week and the library hosted a display for International Day for the Elimination of Racial Discrimination. So we have plenty to get on with telling you. This years Craftex Exhibition takes place from Thursday the 7th until Saturday the 9th of June 2018. 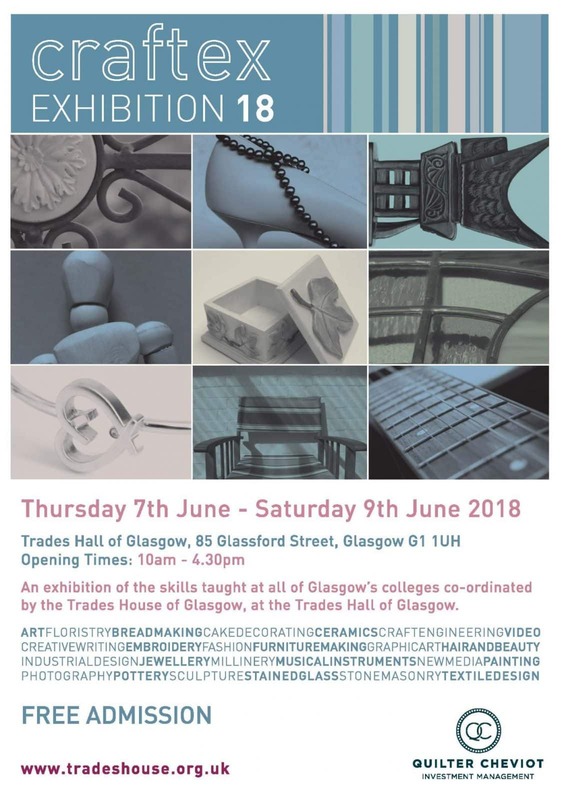 Held in the trades Hall of Glasgow, this is an exhibition of the skills taught at all of the Gasgow colleges, co-ordinated by the Trades House of Glasgow. It really is a great event which gives students recognition in the various industries and last year led a number to employment opportunities and job offers. More details & entry forms here: http://www.tradeshouse.org.uk/education/craftex.aspx. 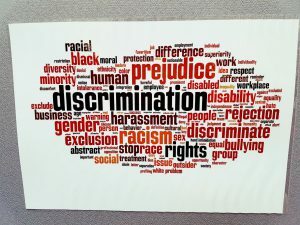 March 21st was the 2018 International Day for the Elimination of Racial Discrimination. This year's theme was promoting tolerance, inclusion, unity and respect for diversity in the context of combating racial discrimination. The Universal Declaration of Human Rights states that all human beings are born free and equal in dignity and rights. Yet racism, xenophobia and intolerance are problems prevalent in all societies, along with countless more forms of discrimination. Why not spend a few minutes watching an informative Powerpoint presentation on the Library plasma TV screen which highlights these issues and library book stock is on display and can be borrowed. Every day each and everyone of us can stand up against racial prejudice and intolerant attitudes. That's us finished for another week, but remember classes resume on Monday the 16th of April. 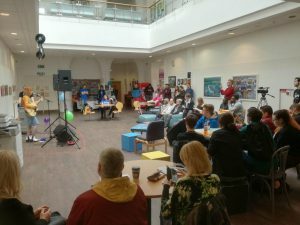 If you have anything you would like included in future Blog updates, please email the details to Tracey on tborland@glasgowkelvin.ac.uk and we will makes sure it is included. Have a great weekend and don't overdo the chocolate! Not long now until all our students stop for the year, we will miss all the activities and events we have got used to over the past months. We have a few good news items for you this time, so let’s get started. 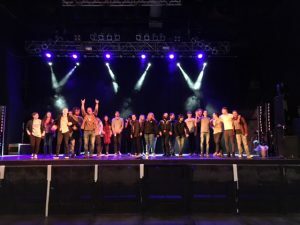 The HND Music Performance class visited the O2 ABC in Glasgow for a Live Performance Master Class, on the 30th of May, where we worked with the venues sound team and the HND Sound production students. 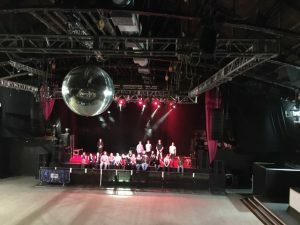 We had a tour of the venue and the Music students got to Perform a Live set on the stage, with the Sound students using the venues PA which is industry standard. Great professional practice and industry experience. GKC’s creative industries students have, yet again, excelled themselves at this year’s Glasgow Trades House Craft-Ex competition. 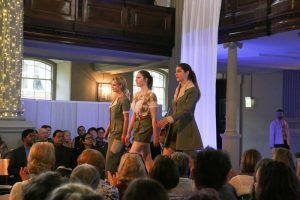 From 13 entries going forward from the College, 9 have received awards in categories ranging through Fashion, Jewellery, Millinery, Photography and the SEN Award. More info and pics will be available soon. Prizes will be presented at the Awards Ceremony at Trades House on Friday 2nd June. Congratulations go to everyone who has been involved with this. The Community & Flexible Learning Faculty staged their Self-Evaluation event at the Platform Auditorium with invited participants from organisations right across the community. Expecting around 50 guests to arrive for the consultation event in partnership with GCC Thriving Places, the team created an impressive and well-organised session to encourage constructive feedback from participants. 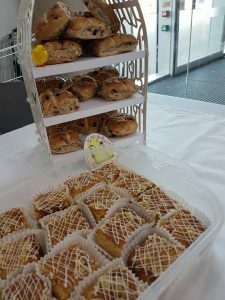 Needless to say, the rolls disappeared quickly and extra chairs were required to seat all those eager to be a part of this evaluation of GKC’s popular Community Awards programme. Well done to all those who worked hard to make this happen and we’re looking forward to seeing the feedback when it becomes available. 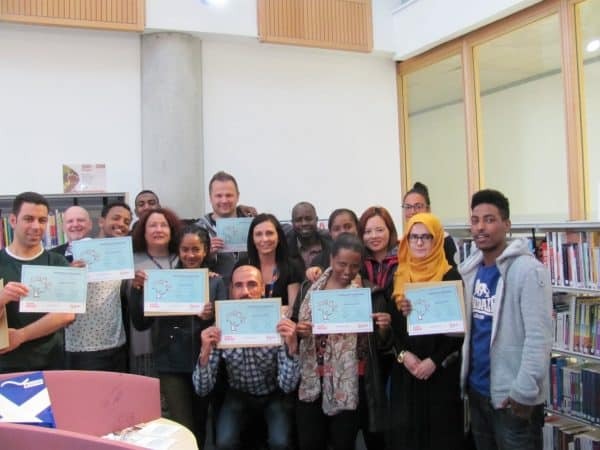 Thirteen of the National 3 Reading ESOL group at Springburn campus were presented with certificates this week by Alan Sherry. The celebration event was held in the campus Library and Flexible Learning centre and the delighted students, and hard-working staff, are pictured here with their awards. On the 31st of May, Catriona Aird, attended a Parliamentary Reception hosted by Gordon McDonald, MSP for Edinburgh Pentlands and Rhona Matheson CEO Starcatchers. 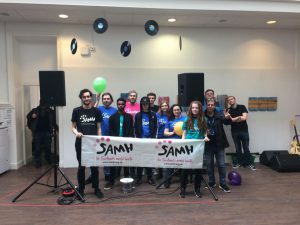 They have been working in partnership with Starcatchers, an organisation which provides arts experiences for young children, for 8 years to promote Creativity and the Arts within Early Years. They currently run a Creative Skills programme as added value to our HNC Early Education and Childcare programme and last year they launched the PDA level 7 Creative skills in Early Childhood Practice qualification. 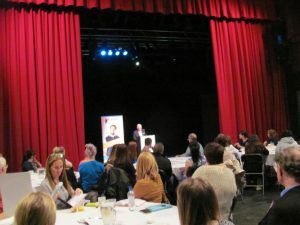 The Reception was attended by a wide range of partnership organisations across Statutory, private and 3rd sector who have an early years remit. 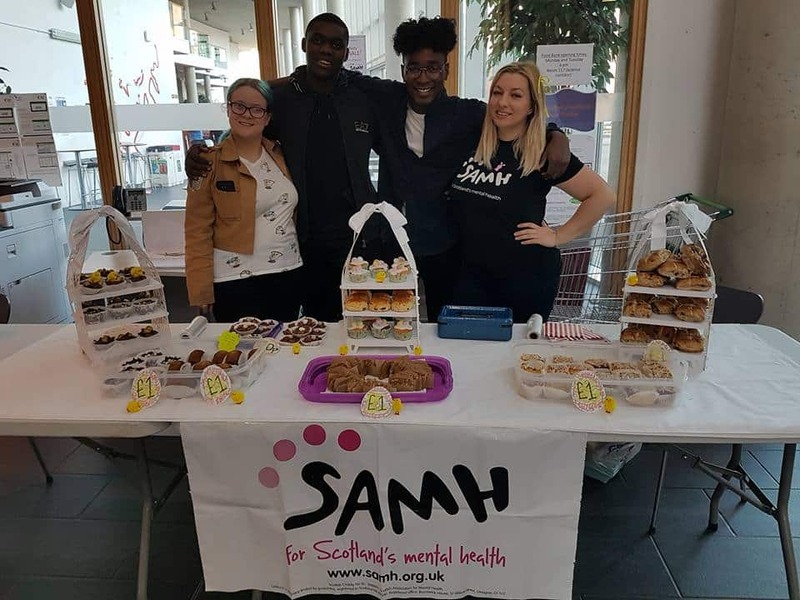 The reception focused on the importance of the Arts in bridging the attainment gap and showcased the work of Starcatchers and also the most current research carried out by the Scottish Government. 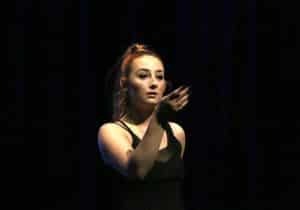 It is hoped that raising the profile of this organisation and the importance of arts experiences will secure future funding and enable our programmes to develop in this exciting area. 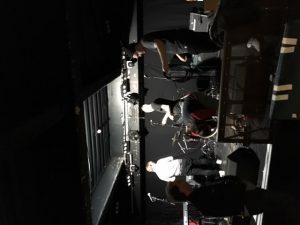 Glasgow Kelvin College in association with Oran Mor and the West End festival 2017 are proud to present the 25th Anniversary showcase of Electric Honey Records at Oran Mor on Friday The 9th of June with doors at 7pm. 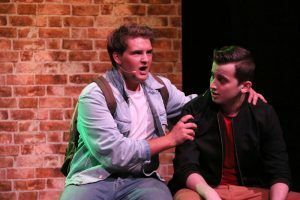 The opening act at 7.30pm with be newcomer and NC Music student “Reilly” followed by the funky street groove of Dopesickfly who will be celebrating the release of their new single “Affirmation Lover”. 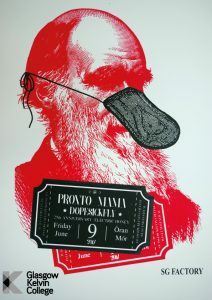 Glasgow Kelvin College along with gallery North present the HND Art End of Year Show, Where Art They Now. This will be on for the next 2 weeks at our West Campus, from the 5th to the 16th of June. Opens Friday 9th June 5.30 to 8.30 pm, all welcome. 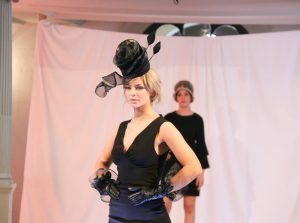 Just to let you know, in case you didn’t already, we have some great photos posted in our Facebook Albums. 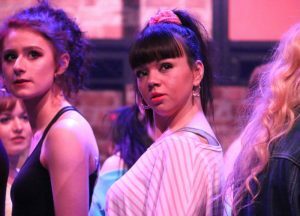 There is a fantastic selection of pictures from the year and only this week we added some from the performance of Fame, the 2017 Fashion Show and the 2017 Dance Show. These albums can all be added to, so if you have any you want included email them to Tracey Borland or if you want a new album started – let us know. That’s us finished for yet another week, hope you enjoyed this update.